Ah Cork. My home city and possibly the most relaxed city in Ireland. Maybe I'm waxing a wee bit too lyrical, but that could be due to the effect of the singsong local accent. Bye bye to the harsh sounds of Dublin, and hello to the Cork lilt. Even after just a few hours in the city, I find my accent strengthening and returning. The main contrast I notice betwen Cork and Dublin is the lack of bustle. Things are simply quieter and less busy in Cork. The South Mall is home to several legal and accounting practices, as well as many other businesses, but the street is pleasantly quiet. The remodelling of the Grand Parade means that people can now sit outside and relax with a coffee. Tis all very continental. And nothing is more continental than that most Corkonian of Cork institutes - the English Market. I used to shop frequently, if not daily, in the English Market when I lived in Cork. I accepted its loss when I moved to Dublin and thought no more of it, but that loss comes home to haunt me as I wander the stalls. Good value butchers selling cruibins and tripe. Fresh bread, charcuterie, cheeses and of course, lots of fish and seafood. The prices and range amaze me - Dublin simply has nothing like it. (For instance, I've been trying to source ham hocks from a Dublin butcher. All have told me that they require a few days to obtain, yet here are ham hocks, both raw and cooked, piled high in the English Market, and priced under €2 each. I doubt I'll be paying that price in Dublin). Just a few minutes walk from the English Market lies a beautiful Art Deco building that houses a newcomer to the Cork dining scene - the wonderfully named Electric. With a scattering of tables outside on the river bank, this venue mixes casual bar dining with a more formal first floor restaurant. The first floor also features an outside covered terrace, which is where we find ourselves on a sunny autumn lunchtime. 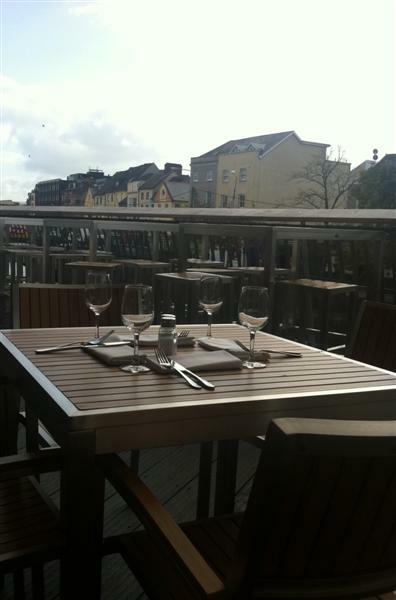 The terrace offers views of St. Finbarr's Cathedral and Sullivan's Quay. 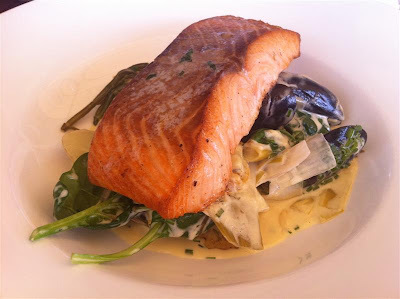 For mains, I chose the fillet of organic salmon with mussels, leeks, samphire and creme fraiche (€12.50). I received a large piece of perfectly cooked salmon which sat atop a mix of fried leeks, baby new potatoes and mussels in the shell. The accompanying sauce was amazing, reminiscent of a bearnaise, with a light silky texture. The samphire had been cooked in the sauce, whereas I would have preferred it uncooked and brighter in colour, but otherwise, an excellent dish, which could command a higher prices in many other establishments. 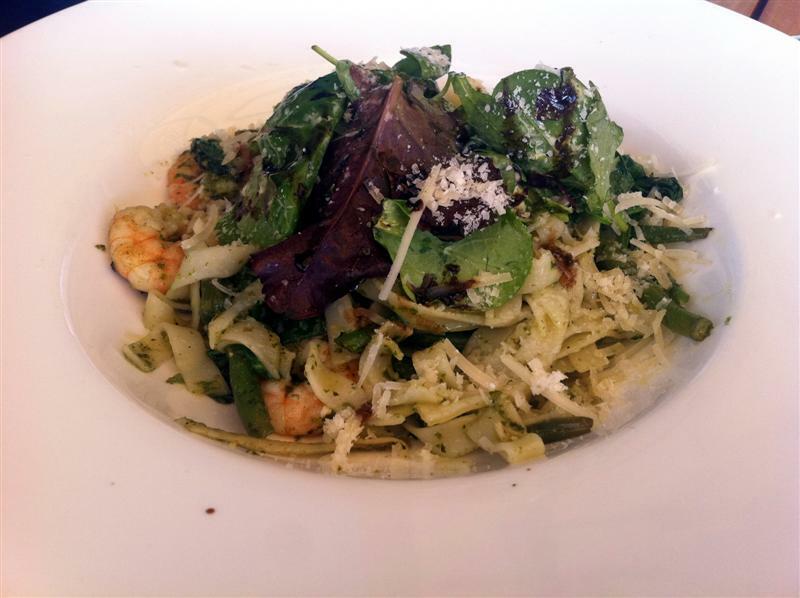 Himself was torn betwen the tagliatelle and cod, but in the end he chose the tagliatelle of sauté prawns & basil pesto (€11). When it arrived, the pasta looked very pretty on the plate with a smattering of leaves, parmesan and green beans. However the pasta was so overcooked that that it fell apart while eating. The flavour though was very good, with meaty prawns and more of the intense basil pesto that had featured on our halloumi starter. I indulged with a glass of Martin Codax Albarino (€6.25) which was straw-yellow in colour, aromatic and fresh - a very good accompaniment to the salmon and seafood flavours. Coffees were priced at a reasonable €2.00 each, and our total bill, including some drinks, came to €47.25. Overall, I'm highly impressed with the value on offer in Electric. Main courses are excellent value, with a good standard of cooking (treating the overcooked pasta as a glitch in the Matrix) and generous portion sizes. The interior is lovely, with the Art Deco theme running throughout the interior design and branding. Electric has all the potential to become a Cork institution, a place to which diners will return regularly for watering and dining. Yet another restaurant to note down on my "must visit" list. Food looks really good too. FXBs on Moore Street have ham hocks all the time, they even have pig's heads there. All the butchers on Meath Street have them too; in fact, I get pig's blood for my homemade black pudding from Meath Steet as well so the unsual stuff is out there. It has been years since I have been to Cork and the English market will always be a highlight. 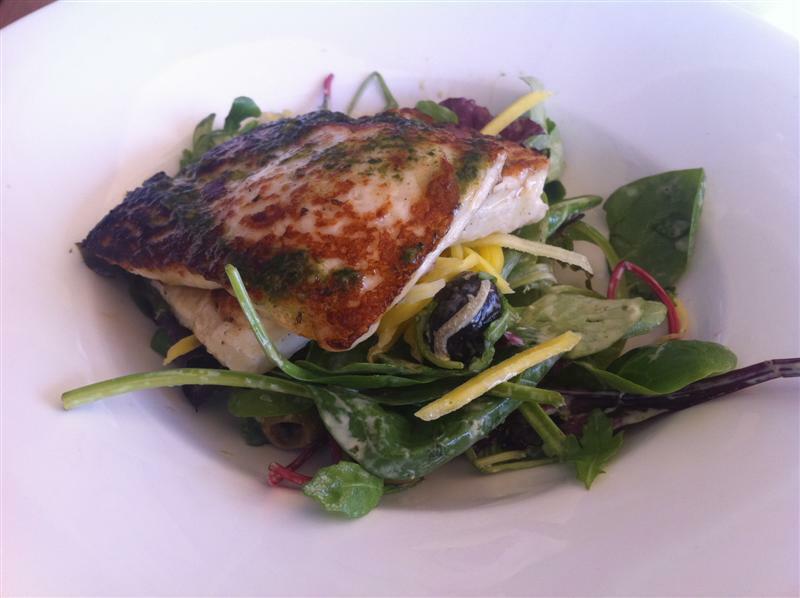 I love Haloumi cheese but tend to never order it because it can be chewy or flabby....Yours looked like it was perfect. Yeah, it's a real shame that a lot of butchers aren't actualy butchers anymore, they just get the meat in vac packed instead of butchering a whole carcass which means all those great off cuts are always on premises. I also think it's a travesty that a city of Dublin's size doesn't have something like the English Market. We've some way to go compared to Cork! Yeah, I live near there and remember getting stuff in the door from the council about it but I thought it had been knocked on the head after the property bubble crashed. You're right, would be brilliant if it went ahead. Stef - There was a recent article in the Irish times about the market. It was planned to have a trial version up and running for November. The major problem is that it involves renovating the market to make it suitable for food retail. Wow. That's brilliant. Nice one for the link, completely missed that at the time.